The CEO of any organization acts as the leader and sets the tone for how that organization is perceived by the outside world. In order for CEOs to help their organizations prosper, they need to have excellent communication skills. 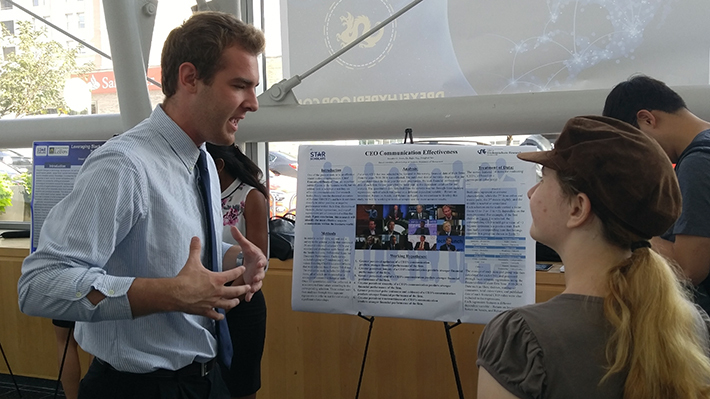 A company whose CEO is an effective communicator is likely to have an overall stronger performance than an organization whose CEO who does not possess strong communication strategies, according to research conducted by Brandon G. Jones, a sophomore at Drexel LeBow, who spent his summer analyzing the rhetoric used by CEOs and how it directly correlates to either the success or failure within their firm. He worked with faculty mentor, Rajiv Nag, PhD, who is an assistant professor of management at LeBow. Jones became interested in the topic when he attended the STAR programs presentations, which consisted of professors giving examples of the research they look forward to conducting or are conducting. “Dr. Nag’s idea instantly stood out to me. I hope to become a CEO and entrepreneur one day, so I was interested in how CEOs build the relationships between them and the success of their firm,” says Jones. This research collected data by sending out surveys to the general public. These surveys featured 20-second videos of randomly selected CEOs. The survey featured an evaluation scale “based off of the Smith-Semantic Differential Scale for Theatrical Performance,” says Jones. They collected quantitative data based off people’s reactions to the videos on the survey and, depending on their answers, compared this information to the company’s performance the year the videos were made. In total, there was a group of 50 CEOs that were selected from Fortune 500 companies analyzed for this project. Jones explained how this research was notable because analyzing the theatrical performance of a CEO is not something people would normally tap into and explore. Jones found that CEOs who performed with more positive traits, such as communicating very well, efficiently, and concisely, did a lot better than the CEOs who did not. “It was amazing to see how CEOs affect their company’s performance, and it’s significant,” says Jones. Jones started conducting this research during this past summer term. He is on co-op right now, currently working for Comcast Spectator, producing Flyers TV as a public relations/video production intern. He says he looks forward to continue working with Dr. Nag on this research in the future.